I came across this piece because of the anecdote, which I’ve discovered has been repeated many times, that it is the most difficult piece of piano music ever written. 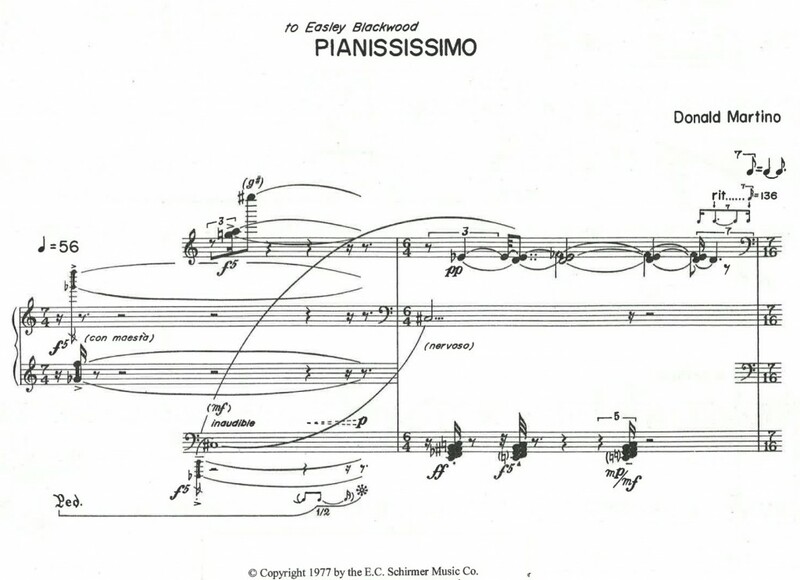 Ordinarily I wouldn’t have cared much, except that the person who commissioned it, and asked that it be difficult, was Easley Blackwood, an interesting composer who also wrote a wonderful book on the mathematics of tuning. Pianississimo is spectacularly difficult, but that isn’t its interest. It’s an ambitious half-hour sonata in four continuous movements, with prelude and coda, and it’s fascinatingly expressive throughout. In that it is worlds away from apparently similar scores by Babbitt, Ferneyhough, and others. This has nothing of the dryness of high modernism or the New Complexity, but it also has little to do with the overt gestures to romanticism in New Romanticism and others. “Pianississimo” raises the very interesting question of how densely and intricately romanticism can live in the middle of the most ferocious atonal modernism, or, to put it differently, how torn apart romanticism has to be in order to continue inside modernism. There are melodies and counterpoints throughout the piece, and a good starting point for listening might be to try to list the ways they are embedded in the thickets of polyrhythmic textures. Sometimes the melodies float in high registers over a pedal, as in romantic music from Schumann onward (around bar 395); sometimes they tick along in pizzicati (produced by plucking wires, bar 323); sometimes as sustained notes in running bass figures (bar 128), very occasionally as sequences of sixths and other intervals, in eighth notes, uninterrupted by other rhythms (bar 326); sometimes as cadenzas (the closing, and also bars 250-253). The full repertoire of romantic rhetoric is here, but hedged in very closely: abbreviated, obscured, drowned out. Some of the strategies remind me of Elliott Carter’s devices. There is one unique performance instruction (bar 36): play ppp notes cantabile, pp morbido, p dolce, mp espressivo, mf elegante, f con maestà. I couldn’t hear that in the performance I’ve been listening to, but it’s evident in the score. 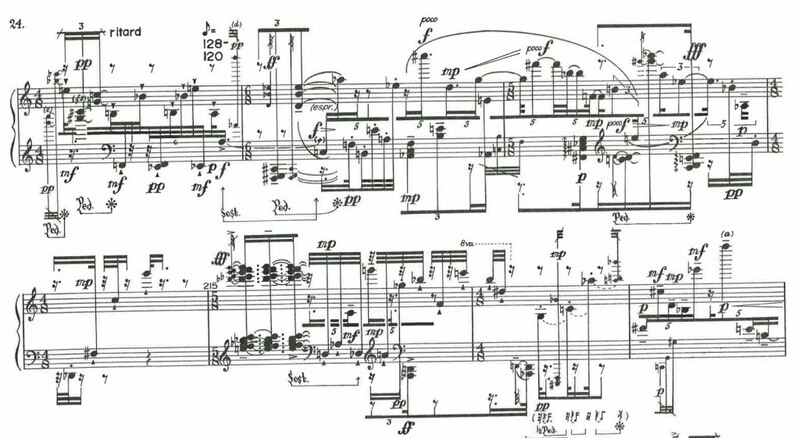 In terms of mood, the piece is mainly tentative, slow, meditative, and given more to hazy sustained and pedal passages than to abrupt or loud contrasts. Even the fast movements tend to let their sharp edges blend into streams of notes. Reviewers point to Martino’s love of Schumann, and the piece’s many echoes of Chopin and Liszt. But that doesn’t mean the piece is at all like New Romanticism: it is as severe as it can be and still accommodate affect, and that is the source of its particular interest. It’s a very pleasing, careful work that I think I could listen to many times. In terms of difficulty: it is unapproachable, for most humans. However there are many isolated passages that are very rewarding. 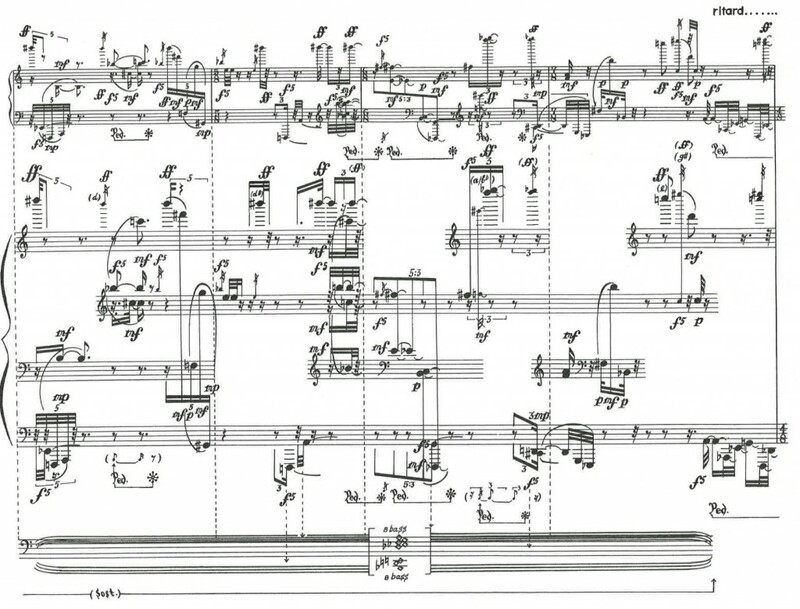 Like many complex modernist pieces, the score contributes visual interest as well as comprehension: but in this case the score is integral because it is hand-drawn, very professionally but not mechanically. The care in the composition is revealed in a number of new kinds of arrangements of ties and staves.